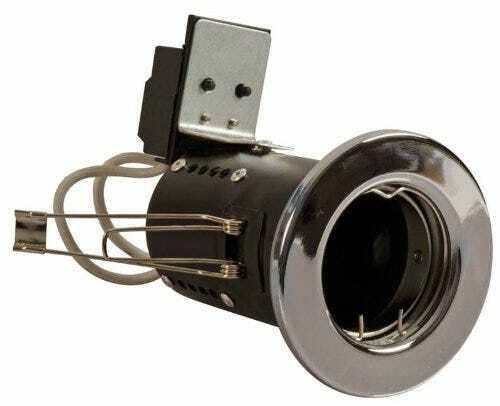 This is an all in one 10w Dimmable LED downlight. It comes complete with 4 fascia finishes, including, brushed steel, white, chrome and brass and 3 colour temperatures. This innovative product is effectively 12 products in 1, meaning you only have to stock 1 product instead of 12 and returns can be kept to a minimum from customers not sure which light temperature to choose. The product comes with a no quibble 5 year warranty. It can be switched easily between 3000K, 4000K and 6000K by a switch on the back of the downlight. The PL001-10W All-In-One LED downlight is dimmable via trailing edge dimmers and has easy plug and play wiring connections. This is the BRAND NEW SOLO Tilt All In One 10w Dimmable LED downlight. It has the same specifications as the normal fixed SOLO downlight and still comes complete with 3 fascia finishes, including, brushed steel, white, chrome and 3 colour temperatures. The SOLO Tilt has been designed to allow 25° of angle adjustment on a fixed pivot which is perfect for customers wanting the features of the standard SOLO with adjustable directional light. This innovative product is effectively 10 products in 1, meaning you only have to stock 1 product instead of 10 and returns can be kept to a minimum from customers not sure which colour temperature to choose. This product has been designed to allow installation in shallow ceiling voids as well as the colour temperature switch relocated on the fascia underneath the bezel. This allows the colour temperature to be switched without taking the downlight out of the ceiling. **Please note that the brass bezel is no longer included in the new SOLO Tilt pack** But it can be purchased separately. It can be switched easily between 3000K, 4000K and 6000K by a switch on the front of the downlight. The SOLO Tilt All-In-One LED downlight is dimmable via trailing edge dimmers.